Since its launch three weeks ago I have been recruiting BBM Contacts amongst friends and acquaintances who have an iPhone or Android phone. I now have over 20 new contacts on iPhones and Android phones and have established five common interest BBM Groups. But for some it required a more detailed explanation of what BBM is about and why you should try it out. If you came via the QR code and wish to install BBM, click on the BBM logo and go straight to the app in the Apple or Google Play store. A link to BBM help is at the end of this post. Android smartphones (4.1 – Jelly Bean – or later). Almost no limit to length of messages; message content can go well beyond the 160 character limit of SMS messaging and can include photos and voice notes (messages) at no additional cost (see carrier charges discussion below). It’s free. While many users will have “local” SMS messaging included in the carrier’s voice plan, BBM simply requires that you have data access through either WiFi access points and/or, optionally, a carrier data plan. Another cost aspect: there’s no charge for sending pictures and voice messages (Voice Notes in BBM); these are extra charges when using MMS and often not included in any SMS messaging plan. Groups: BBM allows the creation of Groups of contacts with common interests. 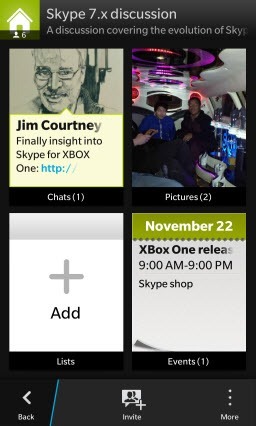 Within a Group, in addition to sending and receiving chat messages across the group, you can share and archive pictures, create lists and share events. The simplest example of using lists is a couple who have created a group where they share a shopping list to not only list what’s needed but also to avoid duplicate purchases. Once an item has been bought by one partner, it’s scratched off the list. But the applications of List are only limited by the user’s imagination. Sharing or Attachments: you can send pictures (stored or camera) and voice notes (messages) to individual contacts. Message Status and Confirmation: Know if your message has been Delivered “D” to recipient and then Read “R” by recipient. Instant receipt: BlackBerry uses a delivery architecture that avoids any potential lags in delivery of email or SMS messages. Unsolicited Contact requests: Almost daily I block unknown Contact requests on Skype (and usually report them for abuse). Unsolicited messages/requests from messaging apps that use your phone number or email address to initiate contact (WhatsApp, Facetime). Using the PIN number also will allow BBM to work on WiFi-only iPads and iPods as they do not have an associated phone number. “Toast” notifications: new messages appear briefly as a banner across the top of the display while in any other application. They also appear in the device Notification Center either on the Lock Screen or in the iPhone’s Today View resulting from a downward swipe from the top in any application. Broadcast message: Select multiple Contacts and “broadcast” a message to them. Not an interactive chat but rather an “announcement” feature. Chat History: all chat sessions are “stored” until such time as you Delete Chat History in the Settings. 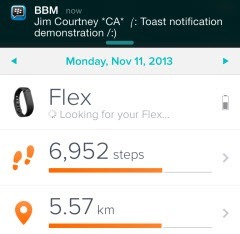 Send FourSquare notifications to BBM (but only on one device). 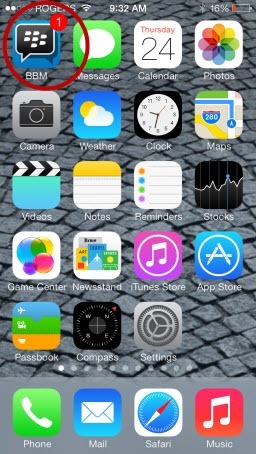 The one limitation of BBM is that you can only have a BBM account running on one device; for my own testing I had to set up a separate BBM account on my iPhone but then that account has been included on all my Groups so that I at least participate in Group activities on both my Blackberry 10 and my iPhone. But BlackBerry needs to look at supporting accounts managed on multiple mobile devices, especially if they go into supporting WiFi-only iPads. Warning: BBM can optionally use a data plan. However, when roaming outside your home country, data plans can become very expensive. I recommend putting your phone into Airplane mode and using WiFi access points when traveling internationally. 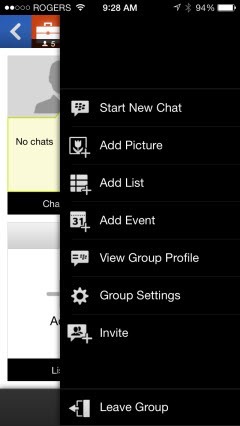 Currently enhanced Chat and the Group features across multiple smartphone platforms are the major distinguishing features of BBM for iOS and Android at the moment; however, we are told to expect BBM Channels, BBM Voice and BBM Video to appear by year end. I am particularly interested in the quality of BBM Voice and BBM Video. Based on my personal experience with calls between BlackBerry 10 devices, it appears that BBM voice and video are supporting superwideband audio (a la Opus – BlackBerry calls it Natural Sound) and very high resolution video (1080p?). It is definitely as good as, if not better than, Skype’s SILK audio technology and 720p video. But acquiring those 20 or more Skype for iOS and Android contacts exposed me to the broader issue of building awareness of the advantages of over-the-top offerings, whether BBM, Skype, WhatApp or FaceTime as examples, across the smartphone market space. But that’s the topic of a follow up post. In this post I will talk about the real issue limiting adoption of BBM on iOS and Android devices, based on my seven years’ experience using various instant messaging applications. And there still needs to be awareness built amongst smartphone users about the overall cost advantages of these offerings relative to carrier charges, especially when it comes to roaming and attaching photos or voice messages. Meantime, BBM is free. Download BBM by going to BBM.com on any iPhone, iPad, iPod or Android phone. That will take you directly to the application in the Apple App Store or Google Play store. 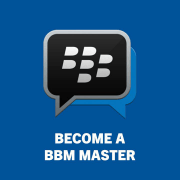 BlackBerry Help provides additional information on Getting Started with BBM on Android and iPhone.